Sidereus nuncius. -- Venice: apud Thomam Baglionum, 1610. The modern face of the moon first emerged in the early evening of November 30, 1609, when Galileo Galilei in Padua turned his telescope toward the moon, noted the irregularities of the crescent face, and made a drawing to record his discoveries. He made at least five more drawings of the moon over the next eighteen days, prepared careful watercolor sketches from these drawings, and then selected four of these to be engraved for his revolutionary Starry Messenger, which appeared the following March. Galileo's treatise announced to an astonished public that the moon was a cratered chunk of elements --a world -- and not some globe of quintessential perfection. It was a new land, to be explored, charted, and named. The science of selenography was born. 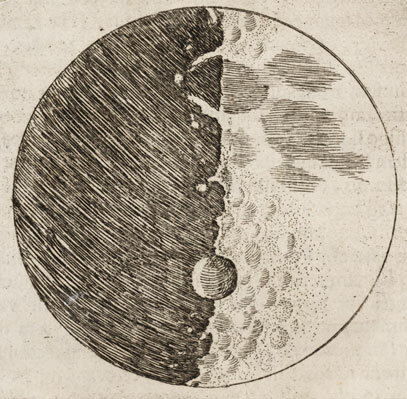 Several lunar features are quite recognizable in this engraving, the second in the series, based on a sketch made on December 3, 1609. The mountains east of Mare Imbrium (Sea of Rains) form the ring at the top, and the sizable crater at the bottom is probably Albategnius, here quite a bit larger than life, and undoubtedly conveying by its grandeur the impression it made on Galileo's mind.